St. Louis, Aug. 9. 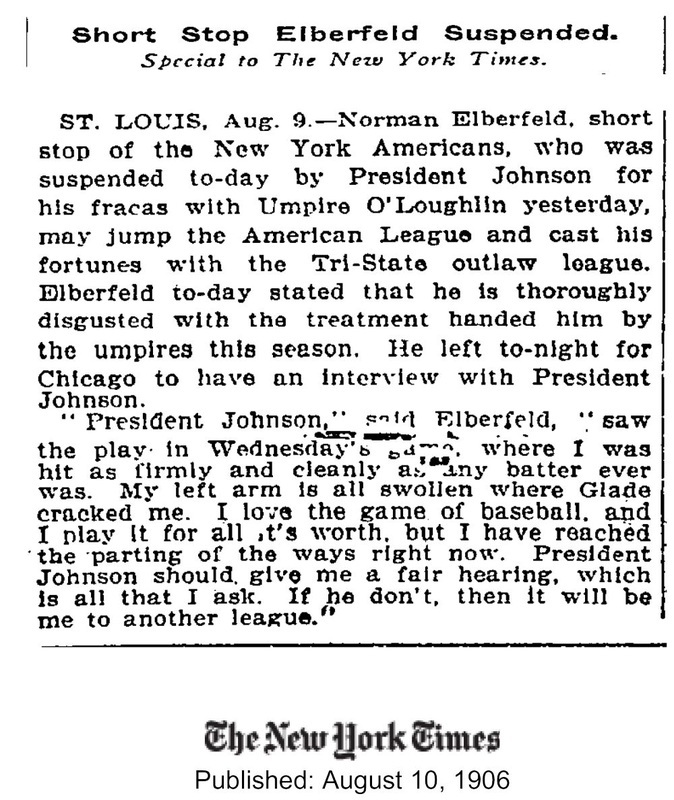 - Norman Elberfeld, short stop of the New York Americans, who was suspended today by President Johnson for his fracas with Umpire O'Loughlin yesterday, my jump the American League and cast his fortunes with the Tri-State outlaw league. Elberfeld to-day stated that he is thoroughly disgusted witht he treatment handed him by the umpires this season. He left to-night for Chicago to have an interview with President Johnson. "President Johnson," said Elberfeld, "saw the play in Wednesday's game whre I was hit as firmly and cleanly as any batter ever was. My left arm is all swollen where Glade cracked me. I love the game of baseball, and I play it for all it's worth, but I have reached the parting of the ways right now. President Johnson should give me a fair hearing, which is all that I ask. If he don't, then it will be me to another league."